As a fellow introvert, GG Renee Hill's of All the Many Layers book, 'Wallflower' resonated with me like crazy. Growing up I struggled with my self esteem and liking myself because I wasn't very vocal, loud and outgoing, I couldn't just walk up to a person I didn't know and make conversation and I didn't like nor want excessive amounts of attention. In middle school my buddies were the librarians, I liked going to the library during lunch because it was quiet and I could read and just be in peace there. I was quiet if I didn't know you and only when I felt I could trust you did I open up and let the silly, fun loving side out and then I was told that I was in fact not quiet. I've since grown comfortable in my skin and unapologetic about who I am but it has been an adventure. The closer I got to thirty, the more comfortable I became and the less hangups I had. Now I love being the observer and processing things and I don't feel bad anymore about loving alone time to do whatever I want to do. I talk when I have something to say and when I don't, I don't talk. I hate small talk but love talking about life, things that people are passionate about and anything spiritual minded. I'm comfortable in my skin and unapologetic about who I am and that's the overall message I took away from the book. 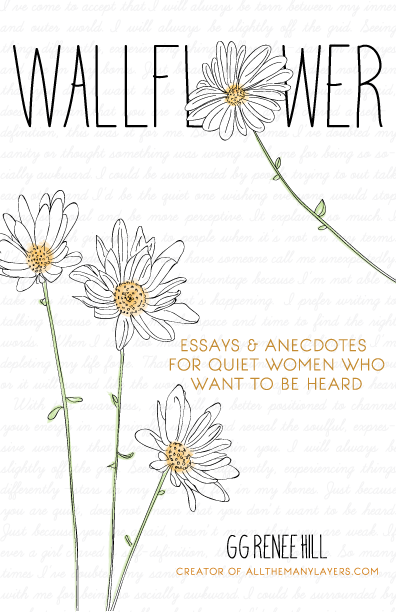 Wallflower is littered with positive and empowering affirmations interlaced with some of GG's experiences that can help encourage readers to nurture their introvert ways instead of hating them and trying to put up a front. It reassures you that you're not mentally ill, socially unstable or a bad friend, mother, lover/wife, etc for needing and immensely enjoying time to yourself at times or being the wallflower at the party. I basically wanted to highlight the whole book. There were so many great points that I totally agree with and have learned throughout my life's journey over time. There is nothing wrong with being quiet and a thinker. There is nothing wrong with not saying anything if you have nothing to say, it doesn't mean you aren't exciting or lack intelligence. You simply don't have anything to say at that moment. I'm an observer too so when in new situations with people I don't know, I tend to be quiet at first. I survey the scene and then decide if I want to participate and if so, how much I want to participate. Wallflower encourages you to be true to yourself but also advises to make sure you don't use it as a crutch either. Growth doesn't come from our comfort zones, it comes from stretching and expanding ourselves and taking risks and chances so while we want to be our authentic selves, it's important we continue to push ourselves to grow and mature as well. If you are single and want a significant other, I doubt you'll find them at home on your couch every weekend. You have to get outside sometimes and engage in things you like so you can meet people. For me, and I'm sure GG agrees, nurturing my "wallflower" ways has actually increased my creativity, productivity, passion and drive. I'm happier and more focused when I respect my need to go inward sometimes, I just make sure I balance it though (or I've been known to be on straight hobbit status!). She talks about this in the book also. Most of my grand ideas and revelations come to me when I'm alone in my thoughts swirling around or I'm writing. Does this happen to you too? They randomly come to me out of the blue. Maybe you are like this too, so if you are an introvert or know someone who is, get yourself or them this book. I finished the book feeling refreshed thinking, "somebody GETS me!" I hope you'll have this feeling too as you start to read and complete it. Thank you so much for this post! As a fellow introvert I can relate to just about everything you said.